One of the most delightful insect visitors to your garden is the hummingbird moth, which deserves this name because they fly and move just like hummingbirds. They can stay suspended in front of a flower while they sip nectar, unfurling their long tongues and inserting them into flowers. They also hum like hummingbirds, fooling inexperienced gardeners. 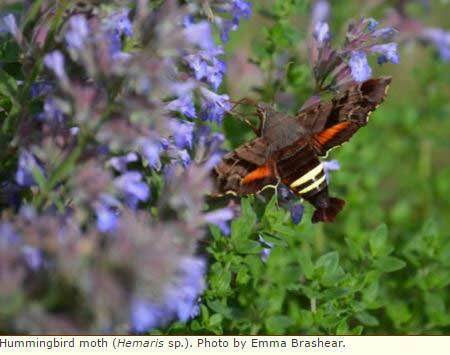 Hummingbird moths are plumper than hummingbirds, and the tip of their tail opens into a fan. They are usually of a rich reddish brown color, at least in part. Like all Lepidoptera their wings are covered by scales; some species lose many of the scales from patches on their wings, so they are called clearwing hummingbird moths. Like most moths they have a very long tongue which they carry rolled under their chins and that they use to reach the nectar of long-necked flowers. Such nectar is inaccessible to many other flower visitors, so it seems that these flowers prefer long tongued pollinators and try to keep the others away. Four species of hummingbird moths are widespread in North America, with several species elsewhere. The British call them Bee Hawk-Moths. The most familiar ones in North America are the Snowberry Clearwing (Hemaris diffinis) - most often found in the west, and the Hummingbird Clearwing (Hemaris thysbe) - more common in the east. Like most moths and butterflies, the adult hummingbird moths feed on nectar from a variety of flowers, but their larvae need more specific food plants, such as several species of honeysuckle, dogbane, or some members of the rose family such as hawthorn, cherries, and plums. The adults start flying in early spring, but chances of seeing them when are better in the summer when the bee balms are in bloom. If your gardens blooms with phlox (Phlox), beebalm (Monarda), honeysuckle (Lonicera) or verbena (Verbena) these visitors are more likely. The females produce a pheromone from glands at the tip of the abdomen. After mating, they lay their tiny, round, green eggs on their larval food plants, usually on the underside of the leaves. The caterpillars have a horn at the rear end and are commonly green, well camouflaged among the leaves. When they are fully-grown they drop to the ground, spin a loose cocoon and pupate, partially protected by leaf litter. In the north, where the season is short there is only one generation per year; the pupa spends the whole winter well hidden and the adult does not emerge until the next spring. In the south, there is usually more than one generation each summer.